Confederate leaders Jefferson Davis, Robert E. Lee and Thomas J. 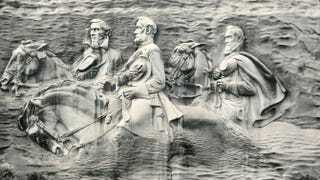 “Stonewall” Jackson are depicted on Stone Mountain. A proposal to place a monument to Martin Luther King Jr. on Stone Mountain in Georgia is coming under attack—from civil rights leaders and Sons of Confederate Veterans. The Atlanta and DeKalb County branches of the NAACP and the national office of the Southern Christian Leadership Conference want to halt the plan because the site venerates the Confederacy, the Alanta Journal-Constitution reports. In fact, they’re calling for the removal of Confederate images there altogether. Georgia Gov. Nathan Deal and the Stone Mountain Memorial Association approved a plan to build an elevated tower that features a replica of the Liberty Bell. It would honor King’s “I have a Dream” speech, which references freedom ringing from the Stone Mountain of Georgia. The plan also includes a permanent exhibit of black soldiers in the Civil War. King’s monument, however, would be located not far from the spot where Ku Klux Klansmen once burned huge crosses, and just beyond the famous giant carving of three Confederate heroes: Robert E. Lee, Jefferson Davis and Stonewall Jackson. “The proposal to include Dr. King [on Stone Mountain] is simply to confuse black folk about the issues. It’s an attempt to gain support from blacks to keep these racist and demeaning symbols,” said John Evans, president of the DeKalb County branch of the NAACP, according to the AJC. Civil rights leaders met privately with the governor to express their opposition to the plan and to press for the removal of the Confederate heroes engraved on Stone Mountain. They said that Deal was receptive but lacked the unilateral authority. “At this particular time, we don’t think he [Deal] has the power himself, but he has the influence,” underscored Southern Christian Leadership Conference President Charles Steele, according to Fox5 Atlanta. Stone Mountain became a memorial to the Confederacy by state law. A hot debate over the future of Stone Mountain resurfaced when Dylann Roof gunned down nine black worshippers in a Charleston, S.C., church last July. But the Georgia General Assembly must pass legislation to remove the carving. Meanwhile, the Georgia Chapter of the Sons of Confederate Veterans also object to a King monument on Stone Mountain. The organization said that move “could warrant legal action,” the Atlanta Journal-Constitution reports. These defenders of the Confederacy said that it would be like flying a Confederate battle flag at the King Center.